We are essentially talking about networking. Most of you may already know this, but networking can be difficult. It’s hard to get around the small talk and really get down to business. But knowing how to start can be just as much of a mystery. First, you must have a plan. Make sure you know who you may be meeting that day. Map out who you want to talk to, what you want to talk about, and assess your skills and connections to see what you can provide for that other person. If you have spoken to enough people through small talk, you might be able to connect other people to each other. They’ll always remember you as the one that introduced them if the connection is successful. Always reach out for that last minute connection. Ask how you can help them or give them an invitation to contact you or connect via LinkedIn. Imply that your relationship could have value by offering your services to them. This goes alongside with following up. Having a brief, great conversation is always a success, but that small talk can definitely turn into something more on another day. If you told someone that you would get in touch with them or vice versa, follow up! Everyone is busy, and just sending an email or a message on LinkedIn can spark that connection. Small talk can go a lot farther than you think. Just find that one thing that you have in common with them and mention it to them again when you follow up just to make sure they can make that connection as well. Making a successful business is all about who you know. Making sure you are running in the right circles and surrounding yourself with great minds and good advice will get you far. But how do we start? If you go to a conference and you just stay with the people you know, you are not being business smart. The world, although filled with billions of people, can actually be very small if you get to know someone. Small talk can bridge the gap between stranger and acquaintance and lifelong business partner. Forget your agenda. Someone with a briefcase full of resumes or a box full of cards is not going to be taken seriously. You’re obviously in the “what’s in it for me” mindset. Just make it your goal to make a connection. Being friendly and open is more of a quality that people will remember rather than just blandly talking about yourself. Never dismiss anyone to get on to the next person. You never know if that lower level employee could have a huge connection for you. 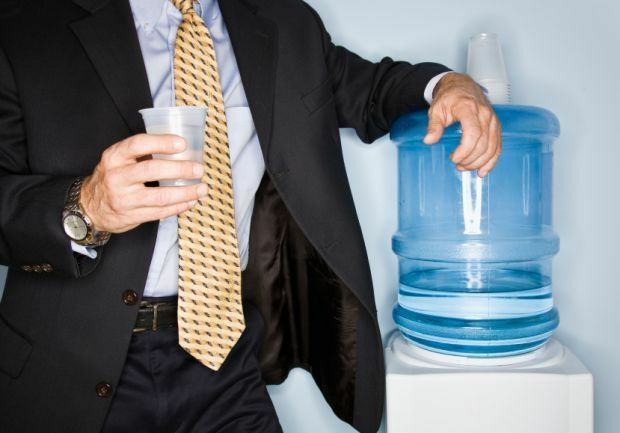 The people that you meet around the water cooler may be in a lot deeper than they seem.